WASHINGTON — Arizona added 17,000 people to its food stamp rolls in October, as near-record-high levels of assistance continued to stubbornly hang on after 18 months. The increase from September to October brought the total number of food stamp recipients in the state to about 1.14 million, according to the latest report from the Arizona’s Department of Economic Security. Households getting food stamps in the same period grew from 483,317 to 490,522. Advocates saw good and bad news in the numbers: Good in that more people are getting assistance under the Supplemental Nutrition Assistance Program (SNAP), bad in that more people are in need. “It’s good in that more potentially eligible people and households are becoming enrolled,” said Brian Simpson, spokesman for the Association of Arizona Food Banks. But he said it is also “a commentary on where we’re at” in terms of poverty in the state. 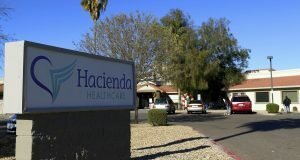 The executive director of the Arizona Community Action Association also had mixed feelings about the numbers, but wasn’t surprised by them. “It’s unfortunate for the number of people needing it, but it’s good that it’s there for them,” Cynthia Zwick said. And the latest numbers may not even tell the whole picture. According to a 2009 estimate, the most recent from the U.S. Agriculture Department, the program was only reaching 71 percent of Arizonans who qualified for benefits. Simpson said the partial participation is not for lack of trying by advocates. “There is robust outreach for people in need to access SNAP, but there are some who will strongly resist assistance for some reason,” he said. Dean and Simpson said there are also many people who do not know they are eligible. And Zwick said that eligible recipients, some seniors for example, are reluctant to participate. But Zwick said many people who may have been hesitant to ask for help in the past may not have a choice now, as savings run out or holidays approach. Simpson agreed that the holiday season can also account for a small increase like the one from September, when numbers had dipped slightly. SNAP is meant to supplement a recipient’s food purchases, Simpson said. The average SNAP benefit for an Arizona household in October was $292.72, while the average per person received $126.41, according to DES. Even if Congress reaches a deal, he does not see an immediate improvement in the numbers. “We won’t see any drops until people find consistent work and make a living wage,” Simpson said. For Zwick, higher employment is the key to lower food-stamp rolls, but she is not overly optimistic. Arizona’s unemployment rate for October was 8.1 percent, compared to a national rate of 7.9 percent, according to the Arizona Department of Administration. Dean said that SNAP participation is a strong indicator of poverty. The Arizona numbers are a flag for “a lot of struggling people,” she said. The poverty rate in Arizona was estimated at 15.3 percent percent for 2010, according to the Census Bureau. Everyday life in Maricopa means living with the highest levels of particulate-matter pollution in the state, according to an analysis of Environmental Protection Agency monitor data from 2000 to 2010.